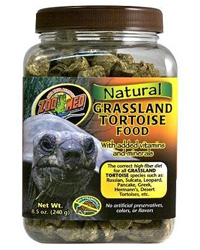 Zoo Med Natural Grassland Tortoise Food combines the ease of a prepared food with the natural goodness of a fresh diet to give your tortoise the goodness he needs to stay a healthy and active animal. Ingredients include chopped grasses, dandelion and yucca to ensure all your tortoises' natural nutritional requirements are met. The necessary long stem fibre found in Zoo Med tortoise food is unique to the Zoo Med brand. Vitamins and minerals are added, but artificial colours, flavourings and preservatives have been left out to create a healthy and naturalistic food. Zoo Med forest tortoise food also provides the ideal fibre and protein levels required for shell and bone growth. Use along with fresh foods for the best possible combination for your tortoises diet. Zoo Med foods are also very useful to leave with pet sitters if you are going on holiday as an easy to prepare complete food.